WAN CHAI, Hong Kong - Dec. 6, 2018 - PRLog -- LocalCoinSwap, the world's first community-owned, decentralized, peer-to-peer cryptocurrency exchange, has officially launched Ripple's XRP onto their platform, making LocalCoinSwap the only P2P cryptocurrency trading exchange to offer fiat pairs for XRP. Providing the cryptocurrency community with choice is paramount to the LocalCoinSwap ethos. Unlike the majority of peer-to-peer trading exchanges, which only list a single cryptocurrency, LocalCoinSwap now offers 17 different cryptocurrency options to trade, including Bitcoin (BTC), Ethereum (ETH), Litecoin (LTC), XRP (XRP), Ethereum Classic (ETC), Bitcoin Cash (BCH), Monero (XMR), Dash (Dash), Synthetix Network Token (SNX), Synthetix USD (sUSD), Skrumble (SKM), Golem (GNT), Waltonchain (WTC), Binance Coin (BNB), Power Ledger (POWR), Decision Token (HST) as well as the exchanges own token, LocalCoinSwap Cryptoshares (LCS), which has the unique advantage of providing its LCS token holders with a passive income through the distribution of dividends accumulated via a small 1% fee taken on all platform trades. 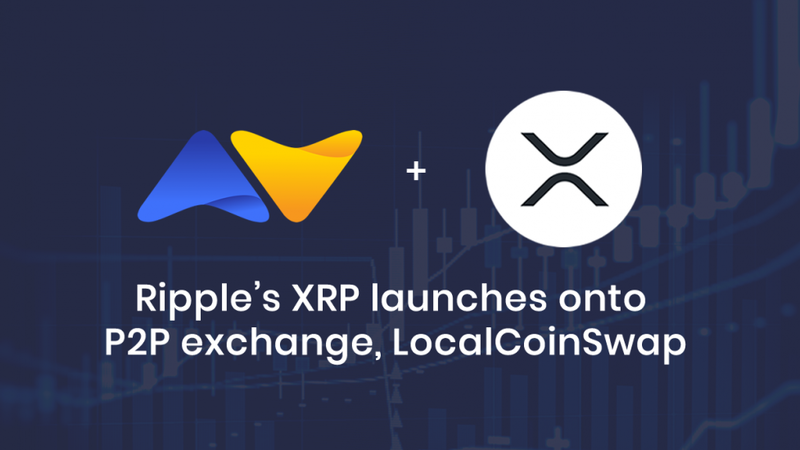 With the addition of XRP to the peer-to-peer exchange, LocalCoinSwap has now added the second largest coin in terms of market capitalization, opening up new trading opportunities and more diverse payment options to Ripple token holders. Not only does such a listing help XRP gain more visibility within new communities around the world but it also improves overall liquidity. LocalCoinSwap prides itself on its inclusivity by removing barriers of entry to assist anyone wanting to buy, sell, store cryptocurrency, or trade it as a business opportunity. The LocalCoinSwap exchange requires no KYC or ID verification, which enables more people to gain access to cryptocurrency trading, and has 34 different payment methods available, including cash in person, cash deposits, local bank transfers, credit card, PayPal, SWIFT, TransferWise, and Western Union as well as Amazon gift cards and iTunes Gift cards, to name just a few. Buyers and sellers on LocalCoinSwap can create their own buy or sell listings, just like a traditional marketplace, or explore the listings of others in order to choose the best trades and make money according to their own terms. Providing people with the ability to choose their preferred trading pair, such as XRP, as well as improving accessibility are both critical to widespread adoption, particularly in areas where people may not have access to bank accounts, lack access to identification documentation, or need alternative value storage options due to their local currency being in financial crisis. P2P marketplaces such as LocalCoinSwap remove difficult, confusing and often exclusionary steps experienced on centralized exchanges and provide a direct person-to-person service that enables everyone to benefit from cryptocurrency trading. LocalCoinSwap is the world's first community-owned, decentralized, peer-to-peer marketplace, that enables you to make money by connecting and trading with buyers and sellers of cryptocurrency, anywhere in the world. As there are no KYC or verification requirements to get started, anyone can make money quick and easy by simply creating an ad to buy or sell cryptocurrency and promoting that ad on the LocalCoinSwap marketplace. LocalCoinSwap already supports P2P trading in over 17 different cryptocurrencies, with many more on the way, over 30 different payment methods including cash, credit card, debit card, PayPal and more, and has over 166 fiat pairs, making it the largest selection available on any P2P exchange. As a community-focused platform, LocalCoinSwap is the only exchange to give 100% of its profit back to its community, creating a genuine, passive income stream for all LCS token holders and encourages the community to vote in its operation, making it the world's first cryptographic democracy made for and by the people.